A Spring Pudding in a Coventry cookbook of 1807 used spinach juice to make it a green color with butter, sugar and eggs, but no rhubarb. Rhubarb or "pie-plant" could be boiled down, strained, then baked in a pie crust; or layered with bread slices; or put in a basin then boiled, as explained in the following spring pudding recipes. A very early recipe for Rhubarb Tarts was found in Glasse's Complete Confectioner in 1800. And finally... a really weird combo of rhubarb, prunes and tapioca cooked in... prune juice, from an ad in the Boston Cooking School Magazine of 1915. 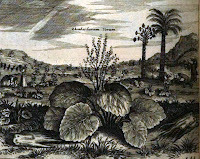 Originally from China (as seen in this 1667 image), the roots were dried and used medicinally. During the 19th century a large number of farmers grew the plant to eat as pies, puddings, marmalade/jam/jelly, wine, sherbet, soup or sauce. 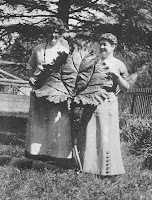 An excerpt at the end of this posting describes some details of the growing, picking and bunching stalks of regular or forced (grown indoors) rhubarb. "Of late years this has become a much-sought-for and important vegetable, but half a century ago [1820s] it was scarcely known in the London market. … The leaf-stalks are pulled for market as long as there is a demand for them; and even in late summer large waggon-loads are often disposed of to jam manufacturers. Large quantities of the early [forced] Rhubarb in our London markets come from Yorkshire. It is forced by the warmth of the waste water from the boilers of the factories in the neighbourhood of Leeds and Bradford, and has become a useful vegetable in January and February. Rhubarb may be forced in an early Peach-house, in a Vinery, Mushroom house, Cucumber house, or under pots or boxes. 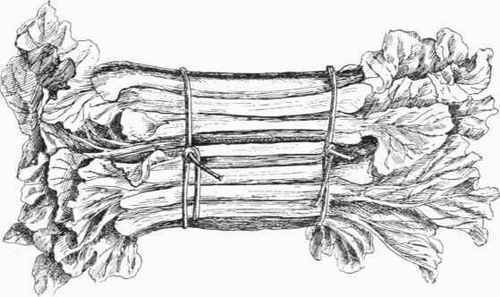 In bunching the Rhubarb for market, a piece of board, padded with a piece of an old bag, is nailed to the bench in the packing shed, and into it four nails or pegs are driven, two withies [osier rods] being laid crossways for tying. The finest leaves are placed in the bottom, the top and ends being alternate, and over them some small ones, making up the outside again with large stalks, so that the small ones are entirely hidden. That the cultivation of Rhubarb is a profitable crop in America, as well as in England, may be seen from the fact that a market gardener, near Providence, sold in that market during one spring and summer nine tons of Myatt's Linnaeus Rhubarb from a quarter of an acre of land. Owing to very sharp competition, he only received £5 a ton for it, or about a halfpenny per pound." 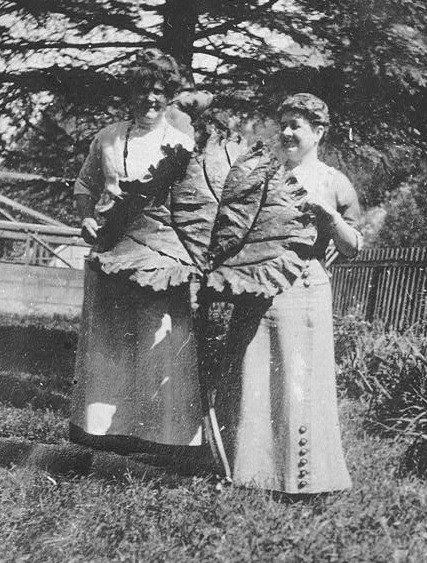 Rhubarb would have been a welcome anti-scorbutic at the end of a 19th century winter.